What could be the mechanism of enduring synaptic efficacies despite the fast turnover of proteins at synapses? The de-novo synthesis of plasticity related proteins may partially provide the answer. However, the newly synthesized proteins must be activated before they are functional which requires a persistent signal of second messenger. In contrast, to conventional kinases the PKMζ is an autonomous and constitutively active kinase, which does not require a second messenger for its sustained activity. Previous experimental results have shown that inhibiting PKMζ activity can effectively reverse the established L-LTP (3–5 hr in slices and 22 hrs in vivo) [1–3]. Here, we explore a question of what could be the mechanism to regulate the PKMζ activity during the maintenance of L-LTP. We propose a self-sustained regulation of PKMζ activity through another autonomously active kinase PDK1. Here, our specific instantiation of an activity regulation loop is the PKMζ-PDK1 molecular pair. The PDK1 regulates the PKMζ activity and its stability through a phosphorylation cycle . We show that the PKMζ-PDK1 loop acts as a bistable switch. Our results imply that L-LTP induction should produce an increase in the total amount of PKMζ at active synapses, and this increase in PKMζ is maintained through activity regulation in the enduring phase of L-LTP (Fig 1). 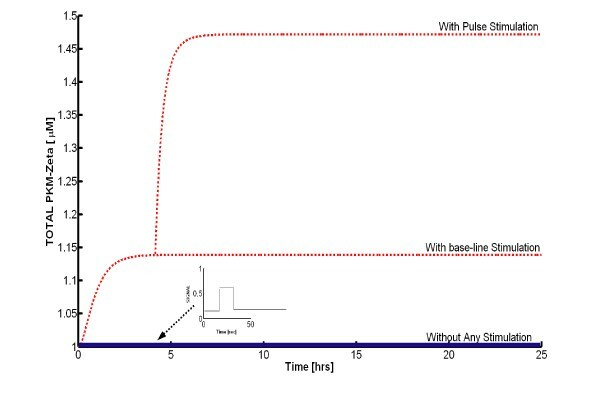 Our results also show that blocking the PKMζ activity in a dose dependent manner can effectively abolish the increase in total amount of PKMζ, (Fig 2) which is in consistent with previous experimental findings [1, 2]. Bistability characteristics of the PKMζ-PDK1 molecular pair. 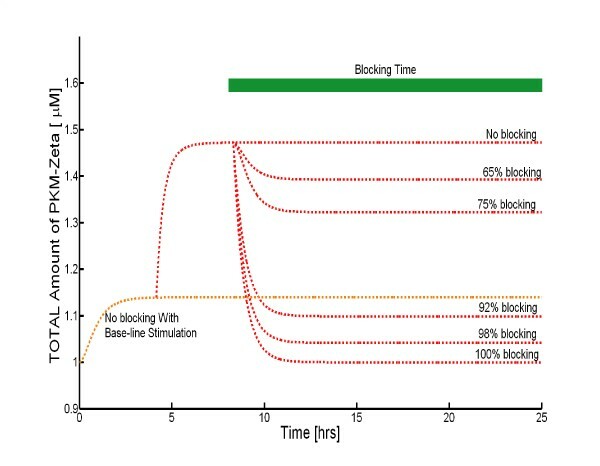 Blocking the PKMζ activity during maintenance of L-LTP.